Between April and September, Mill Meadows is home to a herd of gentle Red Poll cattle who graze on the reserve. By keeping the grass short, they help to encourage wildflowers to grow. 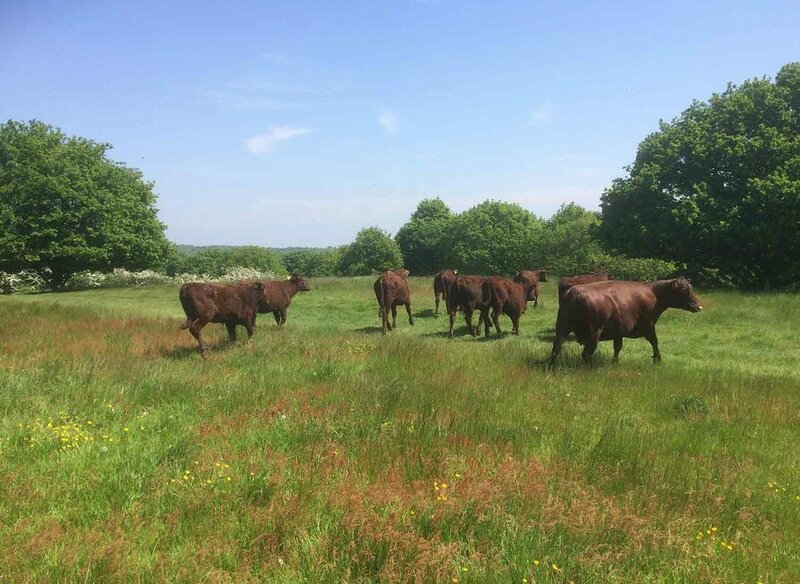 Grazing is an essential part of the management of Mill Meadows and the Red Poll cattle are ideally suited to this task as they are a hardy breed and not fussy about what they graze. In a typical year the Red Poll will be introduced to the Special Scientific Interest (SSSI) in April to graze the grass down then removed to the other fields from May to August to allow the wildflowers to flourish. The cattle are returned into the SSSI in late summer to graze the sward (an expanse of short grass) to around 5 centimetres, which is a condition that must be met to qualify for the environment payment scheme that is paid to conserve the grazing meadows. The cows are docile and unfazed by visitors, but like all wildlife, we ask that they are treated with respect and that dogs are kept under control around them. If you’d like to find out where the cows are currently grazing, use our Cattle Tracker to find their location.